Some dishes just don't get the credit they deserve. You only occasionally remember them, but when you do, you wonder why you don't think of them more often. My mom's impossible coconut pie is one of those dishes. It's just incredible--I had this one mixed up and in the oven in less than 10 minutes and every single bite was delicious. There's no crust with which to wrestle and I don't think I've ever come across a coconut dessert I didn't like. While it takes more patience than I normally exhibit, this pie really is much better after it's been completely chilled. I find that if you eat it warm out of the oven, the egg flavor is just a tad too strong. Considering the ease and time involved, this is one of my very best desserts and frankly, I'm ashamed that I don't remember it more often. Preheat oven to 350 degrees F. Grease a 9- or 10-inch pie plate with cooking spray. In a medium bowl, beat the eggs and add in the cooled, melted butter. Blend in the sugar, flour, and salt, then whisk in the milk and vanilla until thoroughly mixed. Stir in the coconut, then pour into the prepared dish. Bake 40 to 50 minutes or until the coconut becomes golden brown and a knife inserted into the center comes out clean. Let cool on a wire rack, then cover and refrigerate. A luscious treat! This version is really irresistible. Bookmarked. My family loves coconut anything. This pie has me drooling! Your pie looks great! I love coconut and it sounds like a winner to me. National Pie Day is right around the corner, Grace!!! I won't be forgetting this one, that's for sure!!! I could eat coconut flakes by the bag, I'll have to try this recipe. I like cold pie and this sounds amazing! This looks really good and sounds easy to make as well. Yummy. I'm always happy when someone brings this to parties! I will have to make it myself. We love anything coconut! This is a great pie, Grace. There used to be something similar to this involving Bisquick. And it was done in the blender. Wonderful reminder, Grace. I definitely have those desserts and meals also...that are SO GOOD yet I never make them. FOR SHAME. I think this coconut sweet treat is going to be a new favorite! Sometimes, because I am usually in a hurry I don't look at your blog because you use creative names for your recipes and I don't want to spend the time to find out if I am interested. I think it might be better for you to actually post the recipe name and sub name it if you want...just a little tip. I like many things that you post if I decide to take a peek. I still have some really basic (and good) recipes that I haven't got around to blogging about yet. I keep thinking if I keep a blog long enough, they'll all eventually make it! 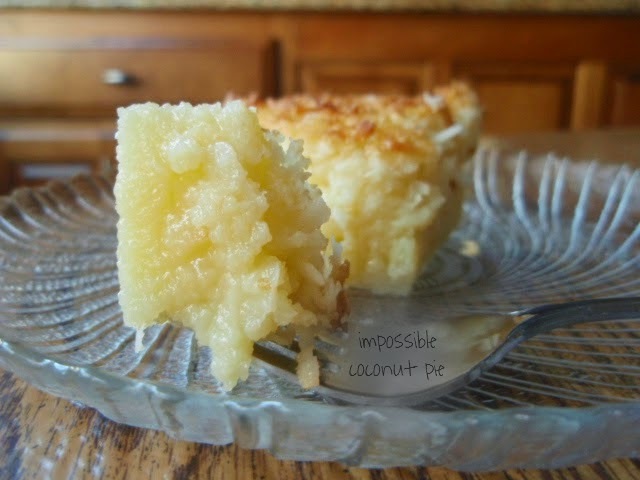 I've made one or two "impossible" recipes, but have never seen the coconut one. Kudos to your mom for coming up with something so delicious. Love coconut anything! That looks good and I don't even like coconut! I could just hug you! My kitchen is being remodeled, and it is finally starting to resemble a kitchen again, but I have very little work space. I am trying to stick with one bowl recipes. I can make your pie this weekend, and my husband will finally know that I still do love him and will bake for him again! It looks amazing. Rice pudding comfort, sunshiney flavour. I've been perusing your blog for a recipe for book club at my home this month. I think this is the winner! Love your blog and your recipes...! Yum! I never understood why so many people don't like coconut! It's one of my fav flavors! Oh my goodness! This looks like a chess pie consistency, which I loooooove! Bravo! This looks so nice and creamy! Can't wait to try this as I love coconut!! I do have a question, do you have to use self-rising flour? I never buy it and wondered if regular flour would work. @TiaRae: Absolutely! Instead of self-rising flour, you can substitute 1/2 cup of all-purpose flour mixed with 3/4 teaspoon baking powder and 1/4 teaspoon of salt and you'll get nearly identical results! I made this pie for my 83 year old mother and she absolutely loved it. She said to tell you that was a great pie and she gives you a 12 rating ao a scale from 1 to 10. Thanks for shareing your recipe. Makeing another one for her today. God bless and have a great day !!!!! My mother always sprinkled nutmeg on top...it was tge best!